The Durban University of Technology’s Communications department, in the Division of Corporate Affairs, recently visited the University’s Journalism Alumnus Gugu Sisilana who is now the Corporate Affairs Manager at the Inkosi Albert Luthuli Convention Centre (ICC). 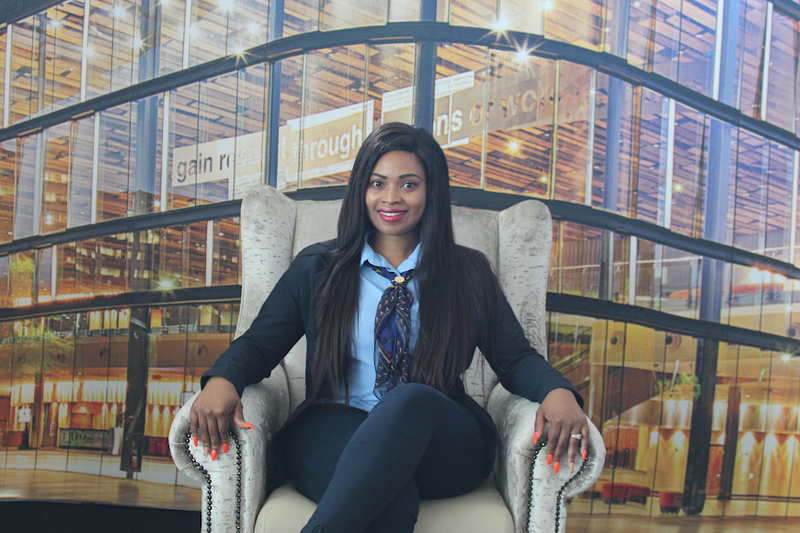 The 31-year-old DUT alumnus (DUT), completed her National Diploma and Bachelor of Technology degree in Journalism, and was in 2018 appointed as the Corporate Manager at the ICC. Sisilana believes that she is a workaholic and gives her all to any task placed before her. The highly motivated Sisilana comes from a small family consisting of her sister Nonhlanhla and her mother. Her (Sisilana) father passed away in a car accident while she was in Grade seven. After her father’s death, her mother then went back to complete her studies of being a teacher, for her to be able to put food in the table for the family. Sisilana completed her matric at New Forest High School, and went to DUT to pursue studies in Journalism. Being raised by a single parent never stood in her way of achieving her goals as a journalist. The reason she chose journalism was because she loves to tell stories and is passionate about writing and giving a voice to the voiceless. Her journey of becoming a journalist at DUT was not smooth sailing, she had to work part-time at a clothing store for her to get transport money. “I had to stay up until midnight at the Steve Biko student computer lab to complete my assignments, the library was my best friend because I believe that knowledge is power,” she stressed. She then completed her BTech in Journalism and was fortunate enough to be hired as a journalist at the Mercury newspaper, where she covered local government and politics. She then worked at the eThekwini Municipality as a Researcher where she researched trends, compiled reports and brief notes for the Mayor and Deputy Mayor. She delved into speech writing, press release writing and writing advertorials and opinion pieces; all her hard work was recognised and she was then promoted as the Municipality’s Publications Manager. As the Corporate Affairs Manager of ICC, Sisilana is responsible for brand management, stakeholder engagement with her organisation’s key stakeholders such as government, local tourism authorities, and educational institutions like DUT, MUT, UKZN and industry players. Working at the ICC is a dream come true, regardless of the challenges she encounters on a daily basis. Some of the reasons she loves working at the ICC is because it enables her to work with diverse cultures, which also gives her an opportunity to learn about different aspects of the hospitality industry and the positive impact it has on the South African economy. “We are blessed to be led by a loving and warm CEO Lindiwe Rakherebe who embodies the true spirit of Ubuntu and reminds us whenever she gets a chance to treat everyone with equality” she said. Her journey at the ICC has enabled her to work with some amazing women who believe in woman empowerment. The advice she imparts to DUT graduates is to work hard. “Volunteer to gain experience and never take an opportunity to learn for granted. Be innovative and look at the challenges South Africa faces and be part of the people who bring solutions to those problems, like starting your own companies to bring job opportunities,” she said.